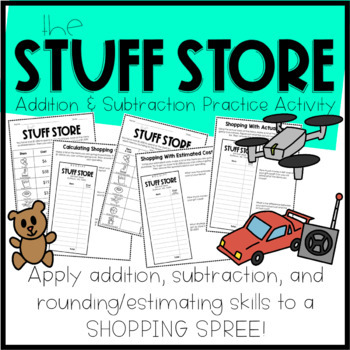 In this activity, students have “won” $1,000 to spend at The Stuff Store. Students will choose what items they will buy in order to spend as close to $1,000 as possible. 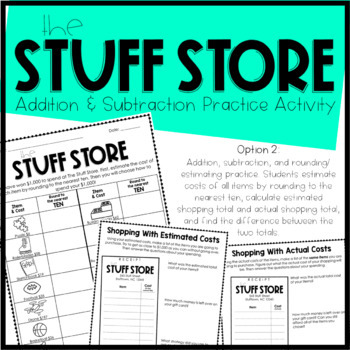 This product includes two versions of the Stuff Store activity so that you can choose which skills your students will practice. Option 1: addition and subtraction practice only. Students use actual costs of items to calculate total shopping costs and how much money is left over. Option 2: addition, subtraction, and rounding/estimating practice. 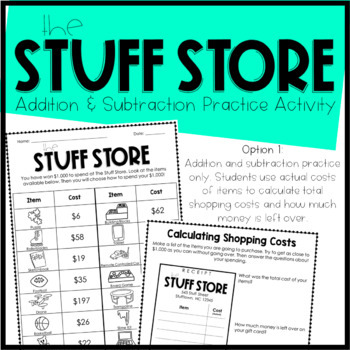 Students estimate costs of all items by rounding to the nearest ten, calculate estimated shopping total and actual shopping total, and find the difference between the two totals.